SANTA MONICA, Calif.--(BUSINESS WIRE)--Leading U.S. toymaker JAKKS Pacific, Inc. (NASDAQ: JAKK) is ready to deck the halls with its lineup of award-winning, innovative toys this season. From cute collectibles and dolls, to interactive tech toys and extreme outdoor play, JAKKS’ diverse portfolio of holiday favorites is sure to appeal to little learners, collectors, and play enthusiasts alike. ‘Tis the season for great value toys the whole family can enjoy, and Squish-Dee-Lish™ squishies are the ultimate affordable and adorable collectibles. This season JAKKS adds new adorable characters to the Squish-Dee-Lish™ family, with all new series of Classic and Wacky squishies as well as a new series of jumbo squishies for even bigger fun! Squish-Dee-Lish™ Series No. 6 features bright and whimsical designs such as a lamb, a princess, a hermit crab, and more! Wacky Series No. 3 introduces new gross, silly, and hilarious designs including, a mummy, a retro arcade game, and a blob! The Squish-Dee-Lish™ Jumbo Series No. 2 presents 7-inch jumbo squishies in six all new adorable styles including a fox, monkey, mouse, and more. Each Squish-Dee-Lish™ comes in a blind bag for an added element of surprise! The Squish-Dee-Lish™ line ranges in price from $4.99 for Classic and Wacky series, to $14.99 for jumbo squishies. FanHeads™ helmets are licensed, foldable, wearable football helmets featuring 65 college teams and all 32 NFL teams. They are a brand new way for football fans to show their team spirit! They are perfect for games, tailgates, and parties, and are easy to assemble, lightweight, and comfortable all season long. Simply pick your team and size, then snap and go! They are adjustable and can fit kids and adults alike. FanHeads™ helmets are a Toy and Game Innovator of the Year Awards Finalist for Art and Visuals and TTPM Holiday Most Wanted for Role Play/Dress-Up List. They are available for $9.99 and are recommended for fans ages eight and older. Education is one of the best gifts of all, and this year JAKKS introduces an exciting new S.T.E.M.-oriented product to its Real Workin Buddies™ line of multi-feature vehicles. Real Workin’ Buddies™ Mr. Banks™ is your personal ATM… Armored Truck Machine, that is! Mr. Banks™ counts, sorts, and stacks coins! Use his motorized mouth to eat bills and keep them safe. Use his keypad and LCD screen to keep track of savings. Kids and parents will love Mr. Banks™ as he makes it fun to learn about money, savings and math! Mr. Banks™ has already been recognized for its unique approach to S.T.E.M. learning, and has won the National Parenting Product Awards Seal of Approval, Parents’ Choice – Fun Stuff Award winner, and Toy Insider’s Top Toy for Preschool. Mr. Banks™ is available for $39.99 and is recommended for kids ages three and older. Requires 4 AA Batteries (included). The Toilet Paper Blasters™ Skid Shot blasts toilet paper up to 30 feet! It transforms real toilet paper into clean spitballs. The Toilet Paper uses water, not spit, for hygienic spitballs that are bio-degradable and easy to clean up with no skid marks! Get approximately 350+ spitballs per roll of 2-ply toilet paper. This novelty blaster is sure to be a hit among all family members, and is perfect for an epic TP battle at the next family gathering. The Toilet Paper Blasters™ Skid Shot is a Hot Diggity Seal of Approval winner as well as a Toy Insider Top Toy for School Age Kids. The blaster is available for $19.99 and is recommended for kids over eight. No batteries are required. MorfBoard™ is a high-performance deck and component system that transforms in seconds to create an entirely new play experience through its Lock & Release Technology™. Simply drop Xtensions into the board and turn them 90-degrees. Launching with the Skate and Scoot Combo, the MorfBoard ecosystem has since grown to include Bounce and Balance extensions for fun anywhere and anytime. This holiday season, MorfBoard continues to introduce families to the world of action sports with the addition of exciting new accessories from grip tape to light-up wheels, as well as a variety of colors including chartreuse, cyan, black and red, and grey and mint. MorfBoard and its accessories retail from $2.99 for grip tape to $99.99 for the full Skate-Scoot combo. 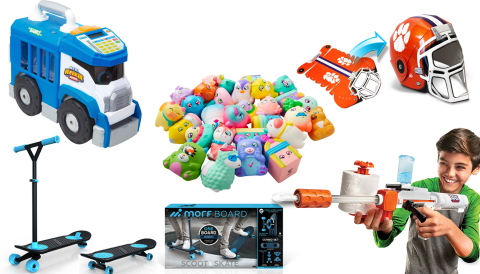 MorfBoard has already won the National Parenting Product Awards Seal of Approval, The National Parenting Seal of Approval, Parents Choice Award, Family Circle’s Editor’s Choice Award, Hot Diggity Seal of Approval, Toy Insider Hot Summer Toy Award and is a 2019 Toy Association Outdoor Toy of the Year Finalist. MorfBoard is perfect for kids over the age of eight. With a wide range of products inspired by popular and premier licensed properties, JAKKS has something for every fan. The Nickelodeon Automatic Slime Drencher™ is a passing game inspired game for two or more daring players. Load up the reusable Automatic Slime Drencher™ ball with a Slime-filled balloon to get started. Kids wind up the timer and then pass around the Automatic Slime Drencher™ ball until the winner gets Slimed! The Automatic Slime Drencher™ item includes four packets of Slime powder, which mixes with water so kids can make their own Slime. Fill the balloons (24) with mixed Slime using the included nozzle and load into the reusable drencher. The Automatic Slime Drencher™ toy is Toy Insider’s Top Summer Toys for School Age Children and a 2019 Toy Association Outdoor Toy of the Year Finalist, is available for $19.99, and is recommended for kids ages six and older. There is nothing more magical than the holidays at Hogwarts. Kids will love to collect die-cast replica wands of their favorite characters from the Harry Potter and Fantastic Beasts series. There are twelve wands to collect, including the wands of Harry Potter, Hermione Granger, Ron Weasley, and other fan-favorite witches and wizards. These wands are four-inch scale and include a stand for display. Each wand is packed in a blind mystery box. The Die-Cast Wands are available for $4.99 and are recommended for wizards ages eight and older. Kids can now train like a wizard with the interactive Harry Potter Wizard Training Wands. There are eleven different spells for kids to learn and master using the included spell training guide. The wand recognizes movement to know when kids have cast a spell. Each wand includes five modes of play: two modes of standalone play (spell training and free play), and three modes to play with a friend (spell practice, wizard tag, and advance training – similar to rock, paper, scissors). The light-up button allows them to select which mode to play. The assortment includes Harry Potter’s Wand, Albus Dumbledore’s Wand (i.e. The Elder Wand), Lord Voldemort’s Wand, and Hermione Granger’s Wand (Walmart Exclusive). The Wizard Training Wands are Walmart Top Rated by Kids, Toy Insider Top 20, National Parenting Product Award Seal of Approval winner, Hot Diggity Seal of Approval winner, and a 2019 Toy Association Innovative Toy of the Year Award Finalist. The wands are available for $24.99 and are recommended for kids ages eight and older. 3AAA batteries are included. JAKKS Pacific, Inc. (NASDAQ: JAKK) is a leading designer, manufacturer and marketer of toys and consumer products sold throughout the world, with its headquarters in Santa Monica, California. JAKKS Pacific’s popular proprietary brands include Perfectly Cute™, Real Workin’ Buddies™, Squish-Dee-Lish™, XPV®, Disguise®, Moose Mountain®, Funnoodle®, Maui®, Kids Only!®; a wide range of entertainment-inspired products featuring premier licensed properties; and C’est Moi™, a youth skincare and make-up brand. Through JAKKS Cares, the company’s commitment to philanthropy, JAKKS is helping to make a positive impact on the lives of children. Visit us at www.jakks.com and follow us on Instagram (@jakkstoys), Twitter (@jakkstoys) and Facebook (JAKKS Pacific).